This Thai Massaman Beef Curry recipe is sumptuous and very flavorful. It's a homemade recipe with no need for any store-bought curry paste or powder. The ingredient list may seem long, but the sauce is quite easy to make. Just toss all sauce ingredients into the curry pot as you prepare them, and simmer together with the meat. 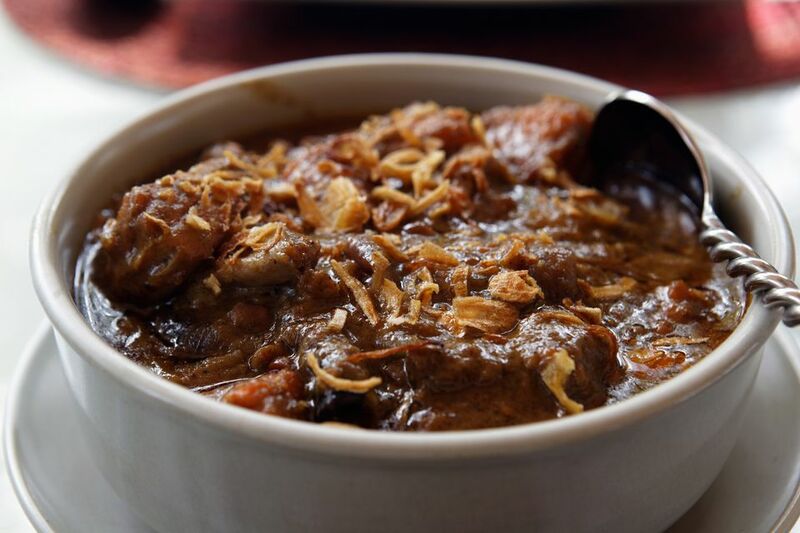 Note that lamb and chicken are often traditionally substituted for beef and that all types of meat make for a delicious Massaman curry. Bay leaves are normally used in Massaman curry rather than the harder-to-find kaffir lime leaves seen in many Thai curry dishes. Other vegetables that are good in this curry include eggplant, green beans, and tomato. Tip: In this recipe, the meat has been pre-boiled for more tenderness—it takes longer, but the resulting taste is worth it. If you're in a hurry, you can easily cut back on this step. If simmering meat 30 minutes or less, leave off the lid or reduce stock to 2 cups. Place stock in a large pot over high heat. Add the meat, onion and bay leaves. If using fresh lemongrass, add the upper leftover stalk pieces. Bring to a boil, reduce heat to low to a simmer. Cover or ​partially cover with a lid and simmer 40 minutes to 1 hour and 20 minutes, stirring occasionally, until meat is tender or near-tender. Add all curry sauce ingredients, stirring with each addition. If desired, hold back a few tablespoons of the coconut milk for serving. Add the potatoes. Return to a boil, then continue simmering 30 more minutes or until potatoes are tender, stirring occasionally. Taste-test the curry, adding more fish sauce for increased flavor/saltiness, or more chili if you want it spicier. If too sour, add a little more sugar. If too salty or sweet for your taste, add a touch more tamarind or lime juice. If too spicy, add more coconut milk (regular dairy cream or milk will work too). Transfer to a serving bowl, or spoon onto individual plates or bowls. Top with fresh coriander or basil plus some additional nuts if desired. Drizzle over reserved coconut milk (if desired), and serve with Thai jasmine rice.